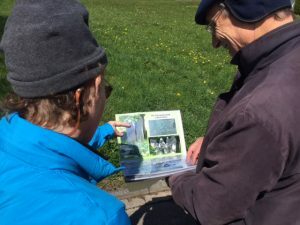 One of the more than dozen ancestral villages visited by lifelong genealogist Caroline Gries was tiny Bechhofen, located in Middle Franconia, Germany. We were lucky to have a local historian, Hans-Rainer Preiss, standing by to help us understand more about the Jewish history of this place. 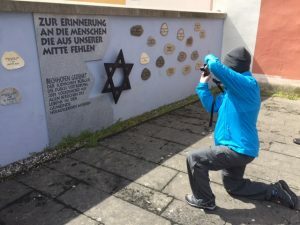 This included a visit to the location of the synagogue, which was burned during the Kristallnacht November 9 and 10, 1938. A detailed model of the synagogue stands in the foyer of the town hall. 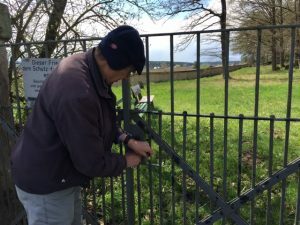 Herr Preiss also opened the gates of the cemetery for us. 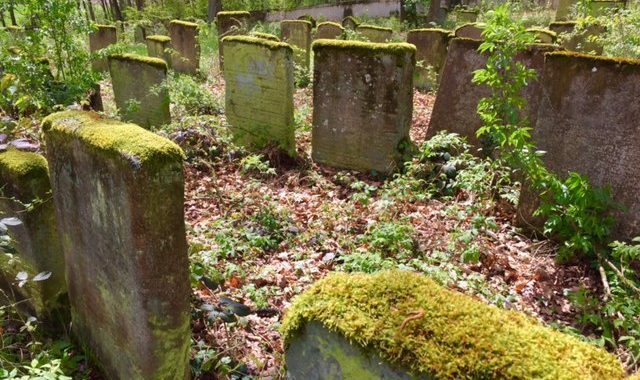 Jewish cemeteries are kept locked out of concern for vandalism or other mischief. We had a detailed map of the cemetery but even so, it was very difficult to locate any ancestor’s graves. This came later, after we had talked with another historian in Ansbach. 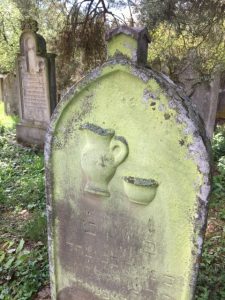 We returned to Bechhofen a few days later, located the very old grave (from the late 1700s) and Caroline got her photo taken next to it. We had to clear away quite a bit of ivy to make that happen, it was fun! The ancestors from Bechhofen were Rabbi Elkan Bar Jonas Adler plus members of the Schnaittach family, Nachman and Salomon. Herr Preiss opens the cemetery gates, one of the elaborate carvings on a well-preserved stone. This means the person assisted the rabbi in the synagogue. Posted in Family History Tours, Germany Tours and tagged bavaria, bechhofen, genealogy, gries, jewish, nachman, saloman, schnaittach.